To facilitate installation of our self-regulating heat trace cables, at Heat Trace Products, LLC., we offer a range of kits and accessories. 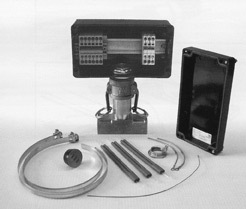 Kits are specifically designed for each series of heat trace cable, and include kits for power connection, terminations, splicing, and end sealing. Accessories include a number of ambient and line sensing thermostats, as well as incandescent and neon monitor lights, and NEMA rated electrical boxes. Additionally we also provide two temperature grades of fiberglass tape, aluminum tape, T-connection kits, and caution labels. Because of our in-depth knowledge of Heat Trace Products, LLC. applications our kits are configured to meet the requirements of virtually any application, and our long list of accessories provides customers with all the materials required for a complete installation.